At the heart of this discussion, I believe two important theories are confused. My contention is 1 ) Heiko Khoo doesn’t fully understand Preobrazhensky, and 2) Preobrazhensky doesn’t fully understand Marx. In this article I deal primarily with the first point. I elaborate the second point in another article. 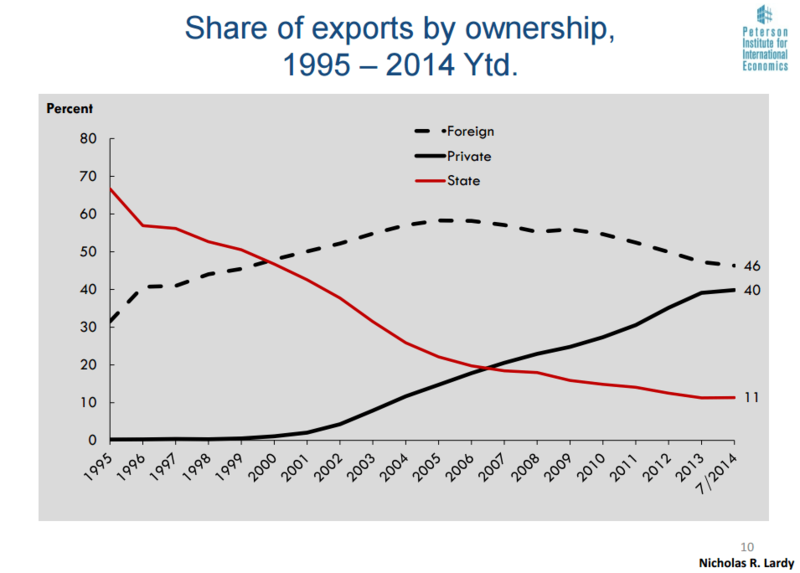 Is China a “Transitional Economy”? Heiko Khoo explains that the co-existence of commodity with the “social product” in the transition towards socialism is entirely in accordance with Marx’s thinking. But more than that, he views Marx’s thinking through the prism of Preobrazhensky. Marxist World has significant differences with some of the ideas formulated by Preobrazhensky. He departs from Marx in important ways. For example he appears to have a linear view of the development of capitalism and the transition to socialism. He describes this process in several places in his book, The New Economics: “In general the war period revealed with complete clarity whither the system of monopoly capitalism is tending; it showed quite clearly that the present day economic system is objectively ripe for socialist planned production and that everything depends only on the coming of the master, that is, on the action of the working class.”. During the First World War, the state and state-planning played an important role in the economies of the warring states, playing the greatest role in Germany. Preobrazhensky saw the state capitalism of the war economies as part of an historical trend. State planning seemed like the inevitable next step after state capitalism in replacing commodity production. Marxist World rejects this teleological approach and this extremely narrow definition of socialism. However, if one accepts Preobrazhensky’s premises that state planning equals socialism, as does Heiko Khoo, does the planned economy dominate the Chinese economy? Preobrazhensky accepted that commodity production can exist alongside the “social product” in a transitional society, provided that the state was in control. But is the Chinese state in control? The subordination of a plan to the private sector is a myth. The state plan has gone. Planning in China is much more like regulation. China, like every advanced country sets broad targets from everything from CO2 output to the number of state dwellings to be built. China’s regulation is not unique. The EU, for example has massive regulatory powers. One example: The European Central Bank (ECB) is the central bank for Europe’s single currency, the euro. The ECB’s main task is to maintain the euro’s purchasing power and price stability in the euro area. But that doesn’t make the EU a Socialist proto-state, despite what some Tories think. There are countless other regulatory features of the EU. What is a contradiction in class society? For Marx it described a phenomenon that was something sharp and antagonistic. Heiko Khoo’s concept of contradiction is the opposite. Assuming that China is not capitalist, then, with the growth of market penetration in China over the last three decades, one would suppose that contradictions would have grown to incredible proportions. But Heiko Khoo’s concept of primitive socialist accumulation – the co-existence of commodity production and the social product – does not describe a concept of contradiction but one of symbiosis. As long as surplus can be pumped out of the private sector to support the state sector then there is no contradiction at all. The state sector, according to this logic, needs the private sector. If there is no private sector then there can be no surplus, and therefore no social product and no socialism. The more capitalism there is, the more the surplus and the stronger grows communism! What Did Preobrazhensky Mean by Co-existence? Heiko Khoo’s idea of state versus private is not the contradiction of town and country, nor of peasant and worker. The agricultural sector, although large, accounts for less than 1 0% of Chinese GDP, compared to 33% of GDP in 1 983. The real contradiction in China is between an ever shrinking state sector, now less than 30% of the economy, and the enormous multi-billion dollar capitalist enterprises dominant in every area from the countryside to the city. Heiko Khoo accepts that there is a contradiction between state and private. In the 1 920s, Trotsky and the Left Opposition in the Soviet Union were desperately concerned this form of contradiction, about the rise of capitalist relations under NEP potentially leading to a restoration of capitalism. 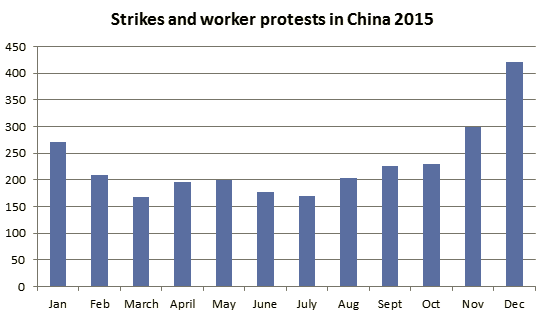 Where, therefore, are the capitalist uprisings against the transitional “workers’” state in China? After three decades of capitalist growth there is no “White Terror”, no uprising, no passive mass resistance, no withholding of “surplus” from the state sector, not the slightest hint of mass resistance to “socialism” from capitalists in China. Individual capitalists may be punished as they are in the West, but there is no collective class resistance. The resistance takes the form of working class not capitalist resistance against capitalism and the capitalist state. The graph below illustrates this point. A “transitional economy” is not an end in itself. Although composed of features of capitalism and socialism, the key word in the phrase is “transitional”. There is a direction in which such an economy is travelling. It isn’t enough to say that a transitional economy is composed of two contradictory features. One must go further and explain how that contradiction will be overcome. Heiko says that where capitalist productive potential has not been fully developed the socialist state may have to support its “introduction”. This is a revealing but unintentional admission. He admits that capitalism has a role in developing the productive forces, even under socialism. What does the full-development of “capitalist productive potential” look like? This phrase is confusing because it does not distinguish between a largely agricultural (peasant) society and a society where urbanisation (proletarianisation) has travelled a long distance. Since capitalism is based upon an ever increasing growth of abstract wealth (M-C-M’), in theory there is no end to the development of the capitalist productive forces. Even if the peasantry has all but disappeared it would still be possible to argue that capitalism has latent productive potential. Heiko’s argument is not an argument for socialism but an argument for state-regulated capitalism. Heiko Khoo bases his view of the nature of contemporary China on Preobrazhensky’s idea of “primitive socialist accumulation”. This means extracting a surplus from pre-socialist formations in order to develop the “socialist” part of the economy. What pre-socialist formations was Preobrazhensky referring to? “The second question to which we must pay attention here is that of taxing of the private economy in the interests of developing industry. If say, our peasant economy…yields an income three times as big as before the war, which is by no means a utopian prospect…then why should we not take one and a half times as much from it as capitalism took? Or to take an arbitrary numerical example: if capitalism took, say 20 roubles, from 100 roubles of peasant income, why cannot the state take 30 roubles from an income of 300 roubles?” Obviously he is referring to a relationship between industry and agriculture, between worker and peasant. He was referring to taxation and a price scissors between industrial and agricultural products, not a relationship between socialism and giant capitalist industries. The pre-socialist formation Preobrazhensky was referring to was that of the peasant, not the capitalist multinational. In 1 926, the peasantry were not expected to disappear in the cataclysm of forced collectivisation. Instead a progressive tax was suggested to fund the growth of heavy industry. Preobrazhensky, nor anybody in the Bolshevik leadership, envisaged handing over the vast swathes of state production to capitalism. Even Bukharin’s instruction to the peasants to: “Enrich yourselves!” was an over-reaction to the previous period of food requisitioning during War Communism. What Was the Bolsheviks’ Attitude Towards the NEP? An extension of capitalist relations in agriculture was ruled out by Trotsky and all of the Bolsheviks outside of the Stalin and Bukharin faction. The idea of capitalism gaining a foothold in the cities was out of the question. Heiko Khoo uses a phrase used by Trotsky to justify his claim that a “socialist state” promotes commodity production. This phrase is clearly out of context. Trotsky saw that there would be an increase in the size of the peasant economy, especially after the years of War Communism, not that there would be a gigantic privatisation programme nor the development of an indigenous capitalist class. Trotsky also believed, along with the other Bolsheviks, that the only way for the workers’ state to survive was for the socialist revolution to spread internationally. This isn’t mentioned at all by Heiko Khoo. But it was ABC for all of the Bolsheviks- except Stalin whose project, just like the Chinese bureaucracy, was for “socialism in one country”. In the short term Trotsky thought that to protect the state sector against the encroachment of the private sector it was vital to maintain a state monopoly of foreign trade. It wasn’t only Trotsky who thought this as essential for the survival of the Soviet regime; so did Heiko Khoo’s guide and mentor, Preobrazhensky. Preobrazhensky (1965) pointed out that: “The monopoly of foreign trade and the socialist system of protectionism is a defence of the socialist economy…” When we look at the vast export base of the private sector both foreign and domestic in China, can we be in any doubt of the immense difference between Heiko Khoo’s assumptions and those of Preobrazhensky? It would be helpful, perhaps, if Heiko could share his ideas on Preobrazhensky not only with Marxist World but also with his fellow columnists. In India, the banks were nationalised in the 1960s. Despite India’s urbanisation and the importance of the state in banking, India is no socialist economy! Take the USA: the Emergency Economic Stabilization Act of 2008 authorised the US Treasury to spend up to $700 billion to purchase distressed assets that included Fannie Mae, Freddie Mac, AIG, General Motors etc. Despite the huge involvement of the US state, not just in bailing out individual companies but in bailing out of the entire capitalist system when Lehman Brothers collapsed, nobody but the Tea Party would suggest that the US state is somehow “socialist”. Both Lynn Walsh and Heiko Khoo have left another important factor out of the equation in evaluating the nature of the Chinese state. A society cannot just transition one way and then another as it pleases. Marx’s Capital explains this to us and gives us the necessary tools to understand where we are. Labour power is now a commodity just as any other. This is the way that surplus is extracted in China. It is not a question of the state extracting surplus from the private-sector, it is about capital extracting surplus value from the working class. The looting of the state economy by those with power and influence was the underlying cause of the Tiananmen Square protests. The violent attack by the bureaucracy on the working class cleared the way for the full scale capitalist exploitation we see today. The bureaucracy’s smashing of working class resistance at Tiananmen was the defining counter-revolutionary moment. There is no transitional road back from that point. A workers’ socialist revolution is on the agenda for the Chinese working class. Such a revolution will pose before the working class the overthrow of capitalism and the guardians of capitalism in the shape of the Chinese Communist Party. Because of this, there has to be an open debate about how to organise a revolutionary organisation and what tactics this organisation should adopt to advance down this road. A socialist society would sweep away commodity production, the law of value and socially necessary labour-time, and would be the most important step to freedom for nearly a century.